Fulcher’s reward for exposing a killer? To have his career in tatters and to find himself accused of gross misconduct. 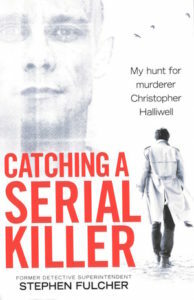 The subsequent conviction of Christopher Halliwell for the murder of Sian and that of second victim, Becky Godden, did nothing to vindicate his actions in official eyes. Disturbingly, Fulcher’s account also suggests that Halliwell, who would end up regretting his confession to Fulcher, may be responsible for more killings. This book, written with Kate Moore, is a riveting if shocking read. It is hard not to be dismayed by the police hierarchy’s desertion of Fulcher and the short-sightedness of the IPCC. Fulcher was badly affected by his bold attempt to save Sian. However, in many eyes –certainly mine included – he has emerged with his integrity fully intact. This entry was posted in True crime books and tagged Christopher Halliwell, Stephen Fulcher by admin. Bookmark the permalink.